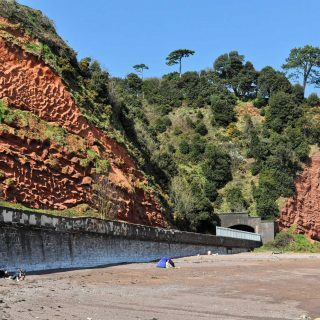 Professor Malcolm Hart will give an illustrated talk on how the diverse geology of Torbay reflects its 400-million-year journey across the Earth’s surface. Note our new venue for this season’s talks. Having gained her masters at Cambridge on Quaternary Science, Dr Jenny Bennett will describe events in Devon from the Pleistocene epoch, some 2.5 million years ago onwards. A talk by Dr Kevin Page (Plymouth University) on ‘Devonian extinctions in Devon’. Booking not necessary. Weekend Field trip with Dave Green. More geology of the Forest of Dean. Please book by 17th February. Day field trip with Dr Richard Scrivener to Blackingstone Quarry and Birch Tor/Vitifer. Please book by 4th July. Day field trip with Dr Meriel Fitzpatric (Plymouth University) to Sandway Cellar, Kingsand. Please book by 20th June. A talk ‘The icing on the cake, the Quaternary in Devon’ by Dr Jenny Bennett (DA Geology Hon Secretary). This talk has been re-scheduled from 3 March.